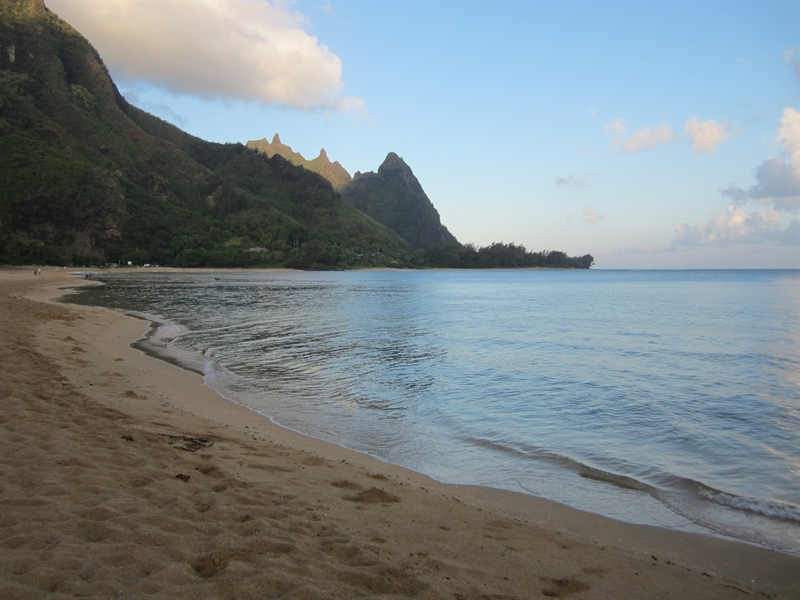 This beach is located at about the middle of the two mile long crescent-shaped bay of Hanalei Bay. Waioli Beach Park is is fronted by a large grass lawn and plenty of shady areas for relaxing in the white sand. The waves are often good for surfing along this stretch of beach and the main surfing area is known as Pine Trees. During winter the waves are only for those who are experienced though beginners can try surfing closer to the Hanalei Pier. Waioli Beach is scenic with mountains in the background and sailboats are anchored offshore during the summer months. Another name for part of this beach is Grandpa’s Beach. Part of this beach is nick-named Pine Trees and is usually where the best surf condition are. Pine Trees Beach is near the end of the beach, near all the, you guessed it, Pine Trees. The waves at Pine Trees are typically a bit larger than to the east at Pavilions, and are smallest near the pier. Pine Trees has it’s own parking, which may be easier to fine and navigate then the public lot. This area usually has plenty of spots and can be found to your right as you drive out of Hanalei Bay. If you get to Waikoko Beach you have gone too far. It’s not a bad place to pull off and enjoy the view. You’ll see the large St. Regis resort opposite the bay. Pine Trees does not have a Lifeguard. There are a few annual surfing contests held here and there are also two volleyball courts that are frequented by locals. Walking westward along the shore you can visit the secluded Waikoko Beach at low tide. Waikoko has generally very calm water. The eastern edge of this beach touches Hanalei Beach Park, at the edge of Princeville. The bay is surrounded by palm trees and a high ascending, densely vegetated ridge. All of Hanalei Bay including this beach may have large and dangerous surf especially during the winter months. Rip currents can form near shore and pounding shorebreak can make swimming hazardous. The area near Hanalei Pier is the most protected, although even this area can be too dangerous for swimming during a winter swell. During summer the conditions are typically very calm throughout the bay but use caution at all times of year. Beginning swimmers should stay close to shore, and never go in the water during times of high surf or rough seas. High surf generates a pounding shorebreak and powerful rip currents along the length of the beach that, over the years, have caused a number of drownings and neardrownings. Lifeguards are stationed at Black Pot Beach Park. Check with them before going in the water. Hello! 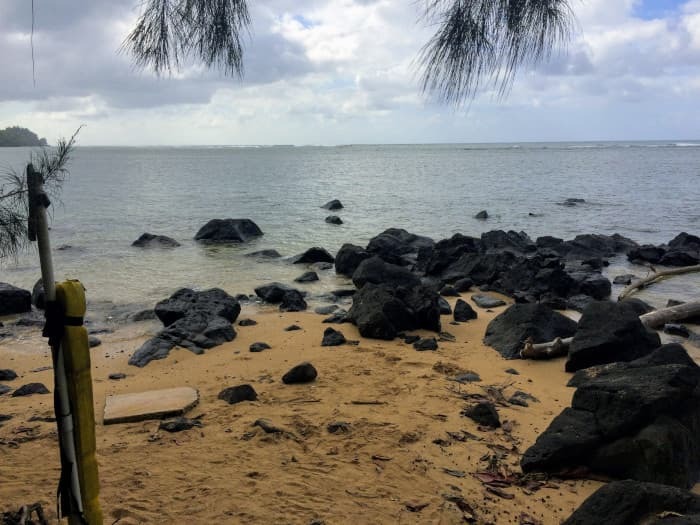 I'm interested in the Waioli Beach Park property, with the URL https://www.kauaibeachscoop.com/listing/waioli-beach-park/ and I'd like to be contacted for more details. Your Phone Your Email Captcha: 4 * 8 = ?